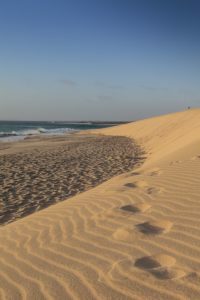 As part of a TUI Care Foundation initiative, we have been working with Project Biodiversity to lessen the environmental impact of nature-based leisure activities on the island of Sal in Cabo Verde. This July, we delivered essential training so that tour guides can take tourists to the sand dunes to enjoy the wildlife and the landscape without disrupting it. It’s not hard to see why these rolling dunes are such a draw for holiday makers but what most people may not appreciate, is just how fragile they are or how important they are in acting as a sea defence for the islanders; sheltering nesting turtles from the bright lights of hotels; and providing a unique habitat for lizards, birds and mammals. The wildlife, particularly the birds and turtles, attract nature enthusiasts from across the world and is a national treasure to be preserved. In July, Sal’s tour guides and excursion providers attended a day-long course and learned about the importance of dunes ecosystems. The group learned how to identify some key unique species and identified desired and undesired behaviors. Some of the key lessons included: driving on marked paths, not walking over the dunes and taking rubbish away with them. Having completed the course, almost all the attendees (94%) felt that they were either effective or highly effective in acting responsibly when leading dune-based excursions which is very encouraging indeed. The next round of training will focus on sharks. This training is very important, not only for tour guides but for any citizen, to learn the importance of the dunes ecosystems. We want to encourage visitors to explore Sal, through the improvement of excursions, and the development of new ones.